A past curling championship is helping a student through pre-med. 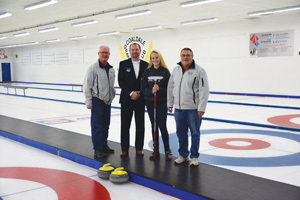 In 2014, the ATB Financial 2014 Canadian Masters Men’s and Ladies Curling Championship was held in Coaldale. A total of 22 teams from across Canada had taken part in the week-long event, which took over 100 volunteers to put on. After the championship, a scholarship was set up for young curlers, using funds raised from the event. Brianne Slomp, a first-year biochemistry pre-med student at the University of Lethbridge, is the third recipient of the $1,000 Canadian Masters/ATB Financial Curling and School Scholarship, who remarked that it was “exciting” to receive the scholarship. “He gave me a slider and took me to the ice every Friday, and I started learning and I liked it, and joined the junior program in Lethbridge,” said Slomp, who is from Lethbridge. From there, she formed a team with some other girls, and continued to curl throughout high school, even helping to coach a junior curling program. She had heard about the scholarship through her curling coach, who encouraged her to go for it. The scholarship has three criteria: the recipient must be a volunteer, a good student and, of course, they must be curlers. Wilson said that one major component of the scholarship was community involvement, which ATB thought was very important. Slomp, with her coaching experience, volunteerism in hospitals and experience with the Interact club at her school, easily ticked off that box. Having good grades was also something she could easily tick off the list. Slomp started university this past fall, and despite the demands of the biochemistry pre-med program, she tries to at least do some curling at least once a week, and has joined the UofL curling league. “It’s been quite difficult at the start,” said Slomp on balancing her studies and curling. “But I’m getting into a rhythm now where I can finally manage to balance everything else.